Isidore was born at Madrid, of poor but very devout parents, and was christened Isidore from the name of their patron, St. Isidore of Seville. They had not the means to procure him learning or a polite education; but, both by word and example, they infused into his tender soul the utmost horror and dread of all sin, and the most vehement ardor for every virtue, and especially for prayer. Good books are a great help to holy meditation; but not indispensably requisite. St. Irenaeus mentions whole nations which believed in Christ, and abounded in exemplary livers, without knowing the use of ink or paper. Glorious St Isidore, intercede for us who invoke you and for all farmers, that all farms may work to accomplish the aim of providing good food for people all over the world and for the birds and hearts on whom our Heavenly Father’s Love feeds and does not allow one of them to perish. We make this prayer through Christ our Lord. Amen. Learning, if it puffs up the mind, or inspires any secret self-sufficiency, is an impediment to the communications of the Holy Ghost: simplicity and sincere humility being the dispositions which invite him into the soul. By these was Isidore prepared to find him an interior instructor and comforter. His earnestness in seeking lessons and instructions of piety made him neglect no opportunity of hearing them; and so much the more tender and the deeper were the impressions which they left in his soul, as his desire was the stronger and the more pure. His patience in bearing all injuries and in overcoming the envy of fellow-servants by cordial kindnesses, his readiness to obey his masters, and in indifferent things to comply with the inclinations of others, and humbly to serve every one, gave him the most complete victory over himself and his passions. Labor he considered as enjoined him by God in punishment of sin, and for a remedy against it. And he performed his work in a spirit of compunction and penance. Many object that their labors and fatigues leave them little time for the exercises of religion. But Isidore, by directing his attention according to the most holy motives of faith, made his work a most perfect act of religion. He considered it as a duty to God. Therefore he applied himself to it with great diligence and care, in imitation of the angels in heaven, who in all things fulfil the will of God with the greatest readiness and alacrity of devotion. The more humbling and the more painful the labor was, the dearer it was to the saint, being a means the more suitable to tame his flesh, and a more noble part of his penance. 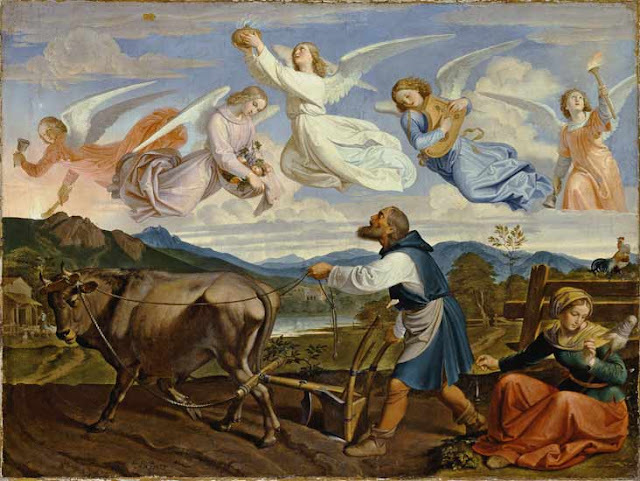 With the same spirit that the saints subdued their bodies by toils in their deserts, Isidore embraced his task. He moreover sanctioned it by continual prayer. While his hand held the plough, he in his heart conversed with God, with his angel guardian, and the other blessed spirits; sometimes deploring the sins of the world, and his own spiritual miseries, at other times in the melting words of the royal prophet, raising his desires to the glory of the heavenly Jerusalem. It was chiefly by this perfect spirit of prayer, joined with, or rather engrafted upon a most profound humility and spirit of mortification, that St. Isidore arrived at so eminent a degree of sanctity as rendered him the admiration of all Spain. In his youth he was retained servant by a gentleman named John de Vargas of Madrid, to till his land and do his husbandry work. The saint afterwards took a most virtuous woman to wife, named Mary Toribia. Those who call her de la Cabeza were deceived by a chapel to which that name is given, because her head is kept in it. After the birth of one child, which died young, the parents, by mutual consent, served God in perfect continency.